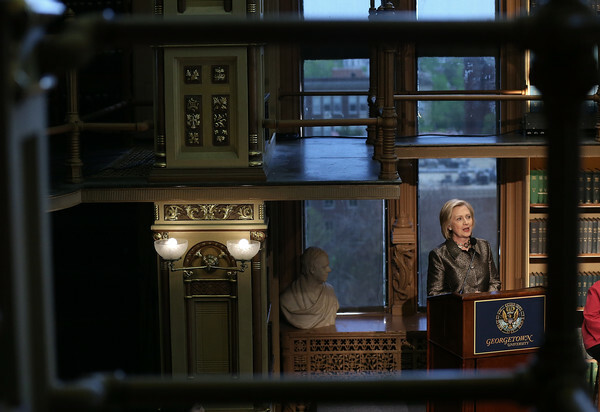 Former Secretary of State Hillary Clinton is set to speak in Gaston Hall on Feb. 5 to present the annual Hillary Rodham Clinton Awards for Advancing Women in Peace and Security to Nadia Murad, a former captive of the Islamic State group, and Wai Wai Nu, a Rohingya activist. 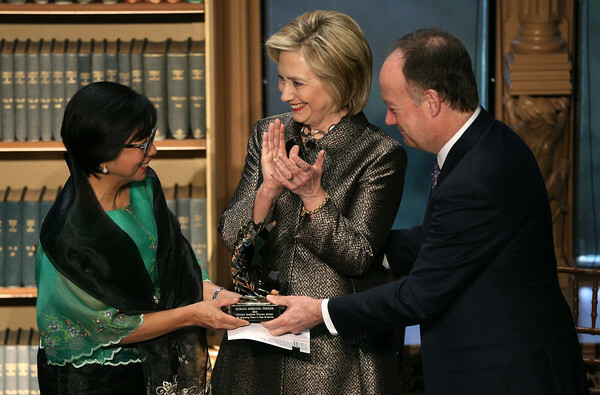 Clinton will also present a second award, the Global Trailblazer Award, to BBC international correspondent Lyse Doucet for her coverage of the impacts of war in Africa and the Middle East on women and children. 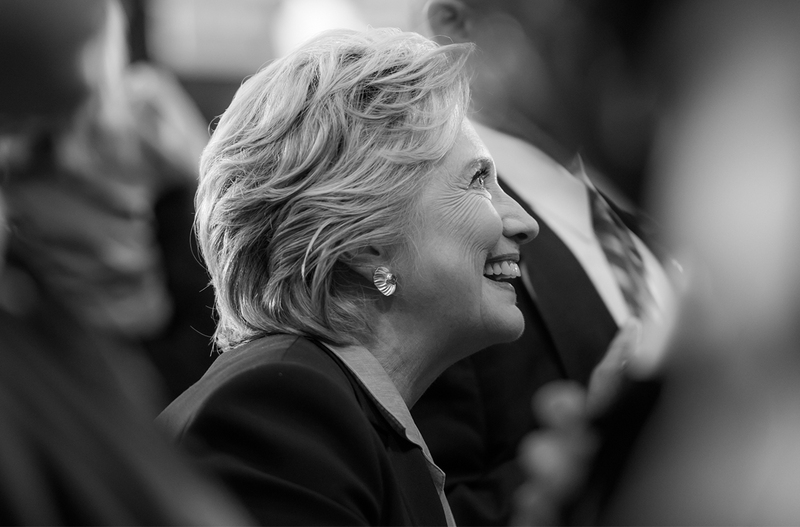 The HRC awards recognize exceptional individuals who advance women’s role in peace-making efforts. 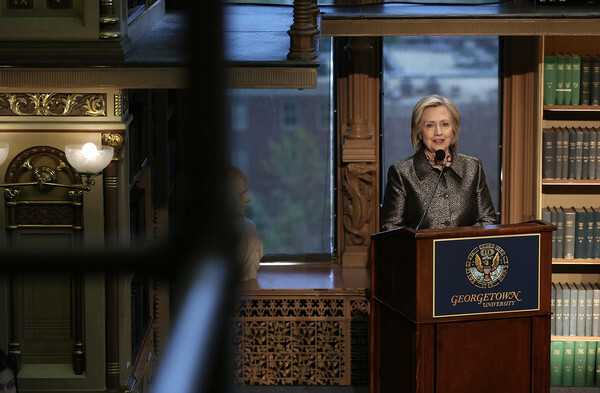 The award is sponsored by the Georgetown Institute for Women, Peace and Security in the name of Clinton, the honorary founding chair of GIWPS. 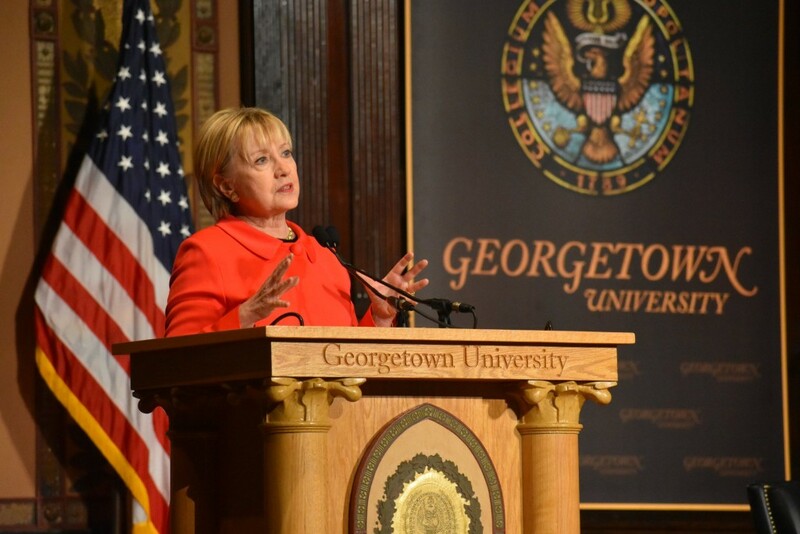 JESUS RODRIGUEZ/THE HOYA Former Secretary of State Hillary Clinton spoke at Georgetown in 2017. 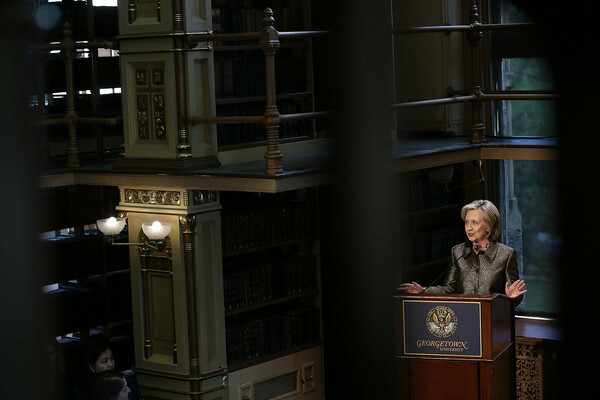 Hillary returned o the hallowed halls of Georgetown University today to present the award named for her to former United Nations Envoy for Afghanistan Staffan de Mistura. 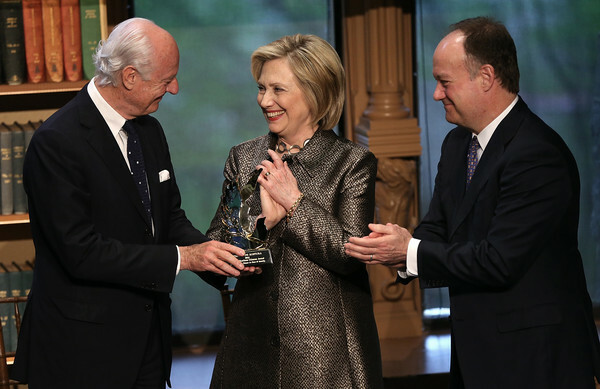 Along with university President John J. DeGioia, she presented the Hillary Rodham Clinton Award for Advancing Women in Peace and Security to de Mistura. Dr. Miriam Coronel-Ferrer, who served as the Chief Negotiator of the Philippines Government in the Mindanao Peace Talks, also received an award at the event. 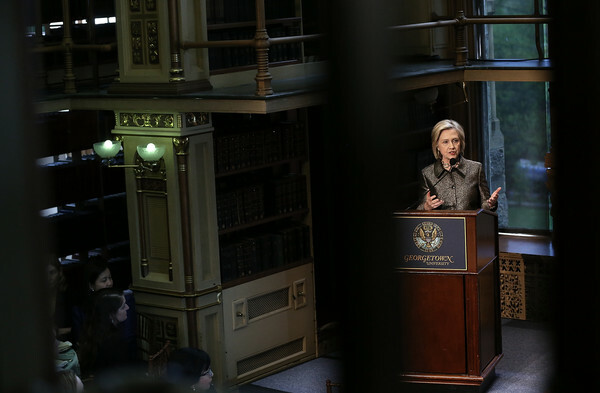 Hillary was once again in Gaston Hall at Georgetown University this morning for an event hosted by the Georgetown Institute for Women, Peace and Security and the Institute for Inclusive Security. She spoke on “Smart Power: Security Through Inclusive Leadership,” and the event was livestreamed. Unfortunately, the only announcement we found was this one dated yesterday, so it was impossible to provide folks with a heads-up. The talk, which will be webcast live on Dec. 3 and begins at 10 a.m., is part of the launch of the National Action Plan Academy, a partnership between the two institutes. The new academy will explore how countries can craft strategies to help women rise into leadership roles on security issues.The Minister of Defence of the Kingdom of Norway Ine Eriksen Søreide will speak after Clinton, which will be followed by a panel discussion on the same theme. 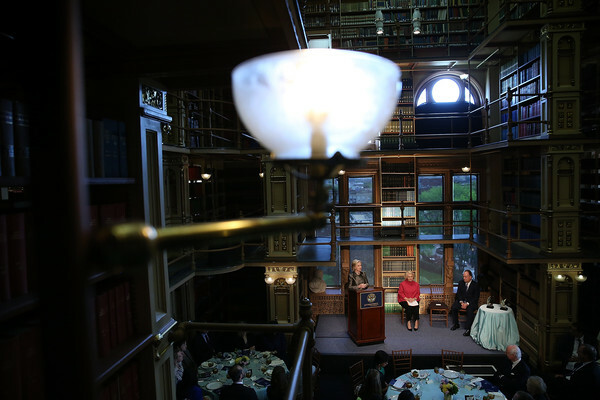 Note to Dana Milbank, M. Scott Mahaskey, and others who chose to focus on attendance: It is difficult to attract an audience to an unpublicized event. 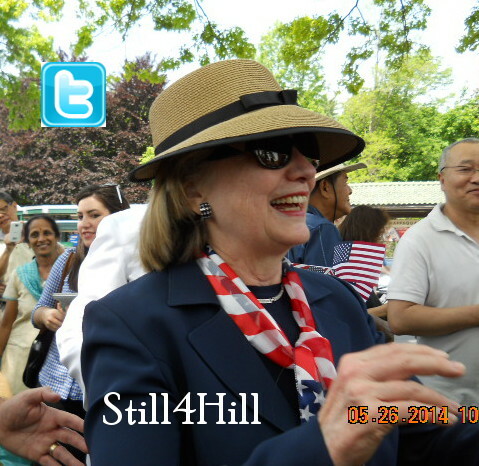 Here at Still4Hill we attempt to keep folks abreast of Hillary’s upcoming appearances. We depend on a variety of newsfeeds for this information. 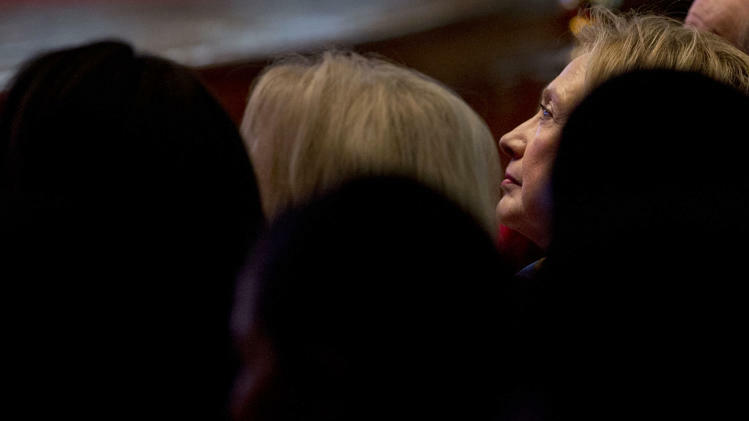 No one gets automatic updates on Hillary’s speaking engagements, and Hillary’s supporters do not have clairvoyant abilities to know when and where she is speaking. Had this event been better publicized, attendance would have been as healthy as it has proven at other events. 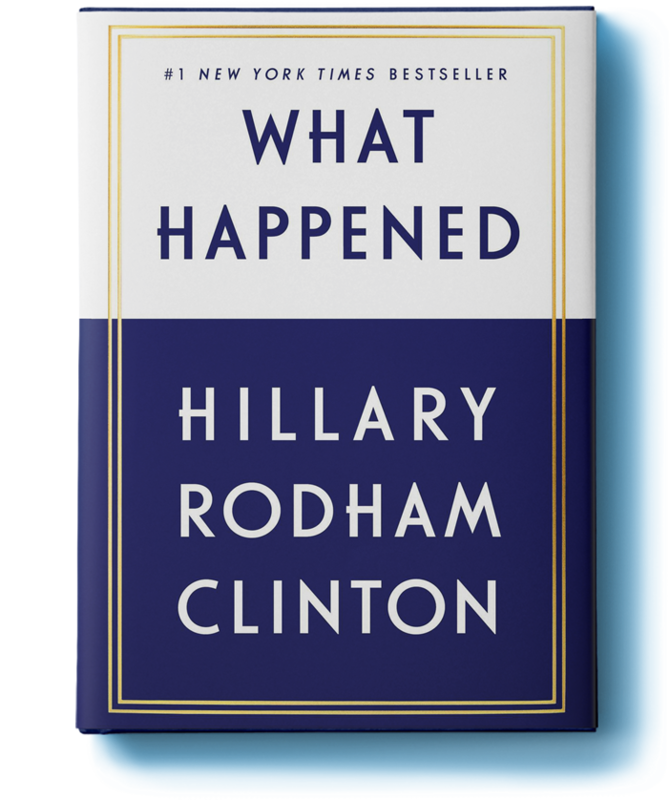 Her speech tomorrow at the Massachusetts Conference for Women has been sold out since before news of it came through in a newfeed. 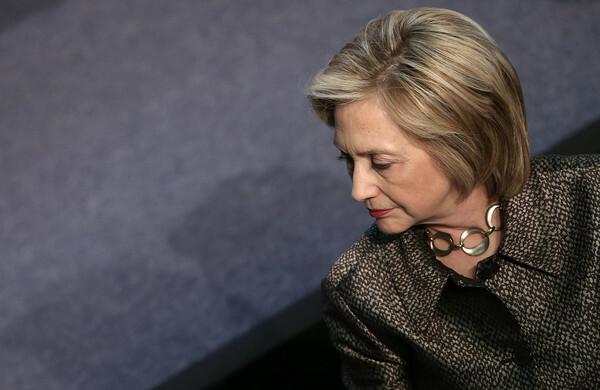 President Barack Obama had an hour-long “catch-up” session Wednesday with former Secretary of State Hillary Clinton to “enjoy an informal discussion on a wide range of issues,” says a White House official. 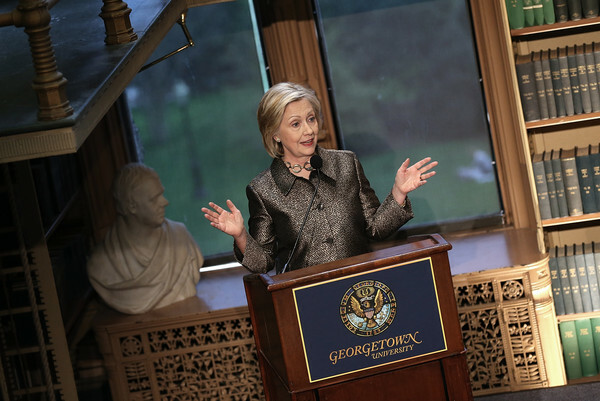 Bill Clinton was delighted to have Hillary in his audience this morning when he spoke at Georgetown University. Reportedly she received a standing ovation. FORMER PRESIDENT BILL CLINTON’S (SFS’68) series of lectures at Georgetown explore the people, events, lessons and guiding principles that have shaped his career in public service. This four-lecture series takes place over a number of years. The lectures will be webcast live. 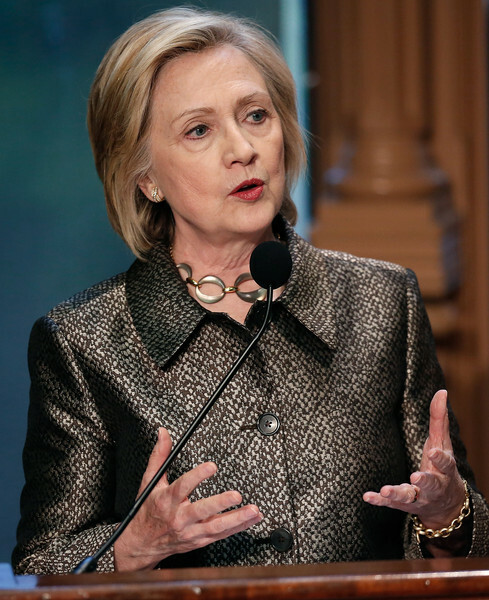 Hillary Clinton: As Visible and Vocal As You Please! 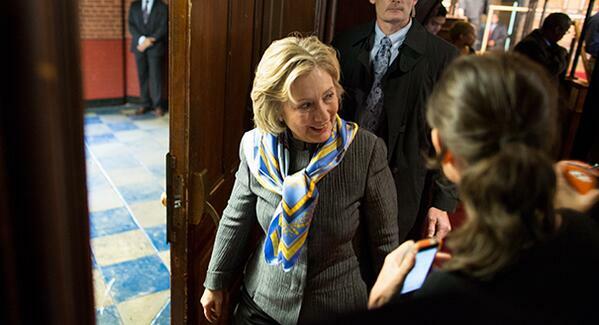 Hillary made a swing through California and Canada the first week of March, was in New York at the U.N. on March 7, was in Montreal yesterday, and back in New York again today. 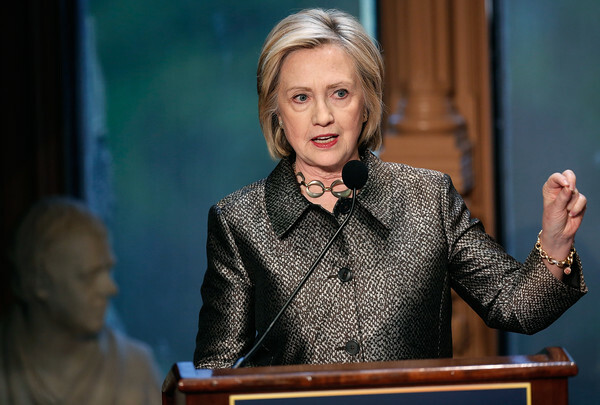 At most of these stops she had some very strong words for Vladimir Putin and his land grabbing ways. 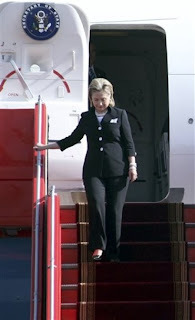 Yet it appears that this now private citizen cannot spend 10 days out of the public eye without some concern troll inventing a health condition or making a tasteless remark like one I saw yesterday involving the missing airliner. 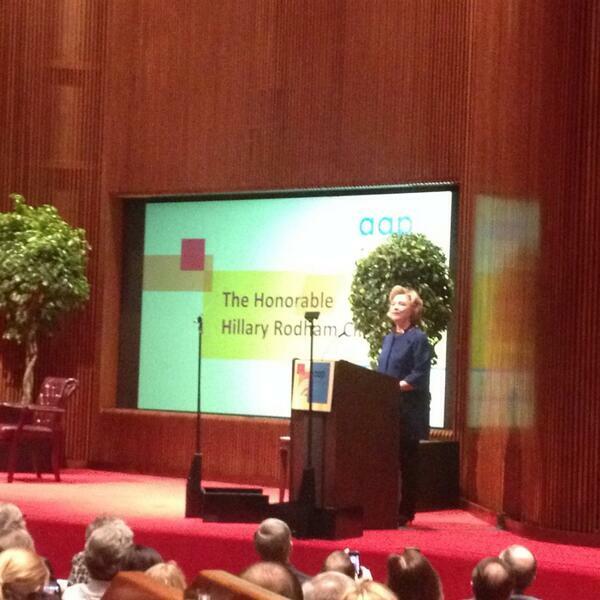 Beginning her speech to the Association of American Publishers at Manhattan’s McGraw -Hill Conference Center today with a shout-out to WaPo’s In the Loop contest to suggest titles for her upcoming tome, Hillary offered tongue-in-cheek guidelines for would-be authors one of which was “quit your day job,” a recommendation she quickly revised. 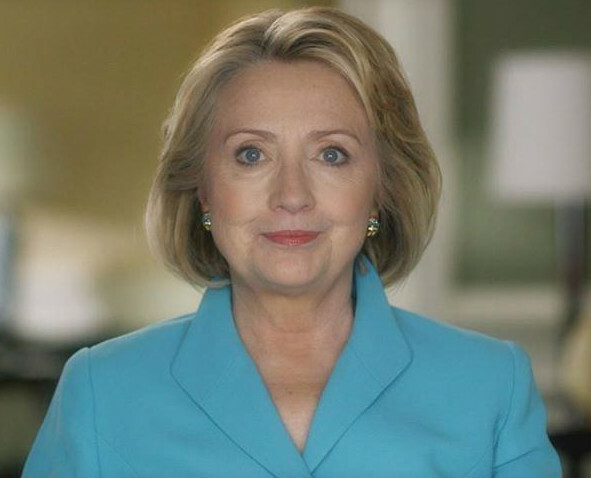 When Clinton wrote Living History, her 2003 title about her life up until that point, she was a U.S. senator and was overwhelmed by the amount of work necessary for doing her day job and writing a book in the evenings. 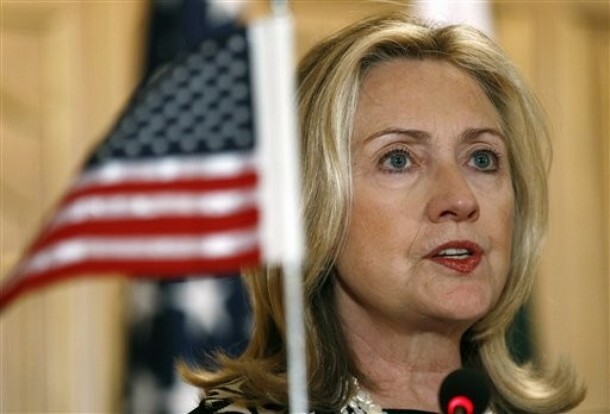 “I was leaving the State Department, stepping off that high wire of American diplomacy. There’d be no more interview requests, no more frantic media speculation about my plans — just peace and quiet. So I thought, let’s write another book. 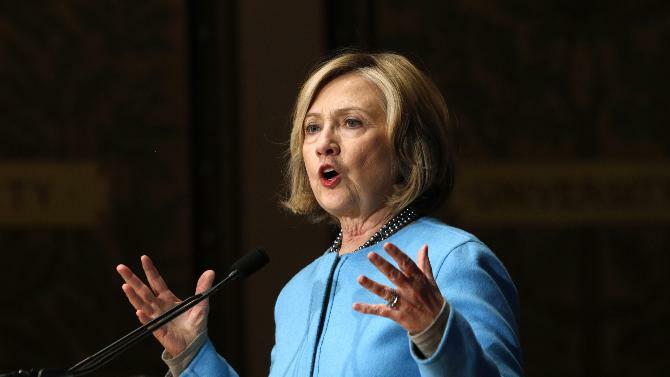 It has not worked out exactly that way,” she said, referring to the constant media speculation that she is planning on running for president in 2016. Absolutely, Hillary! 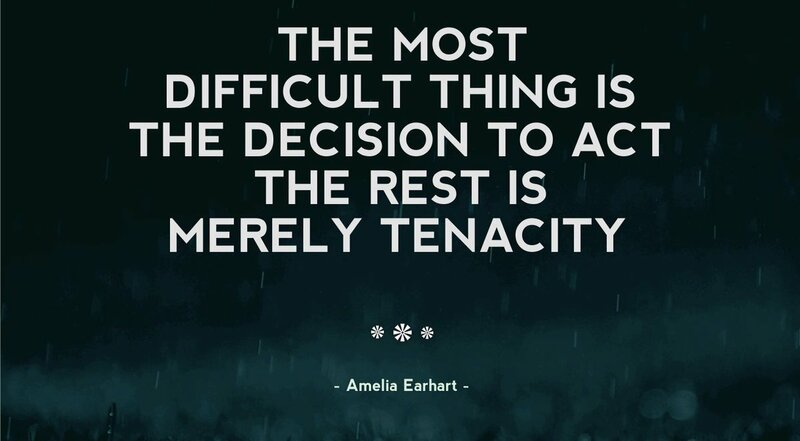 It has not worked out exactly that way. At all! I combed Twitter for twitpics. The only one was this one from Amy Chozick of the New York Times. 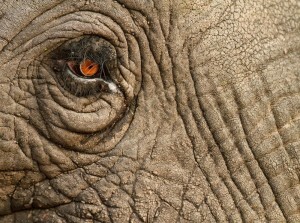 Being the only one, and especially high resolution for a twitpic, it went semi-viral. 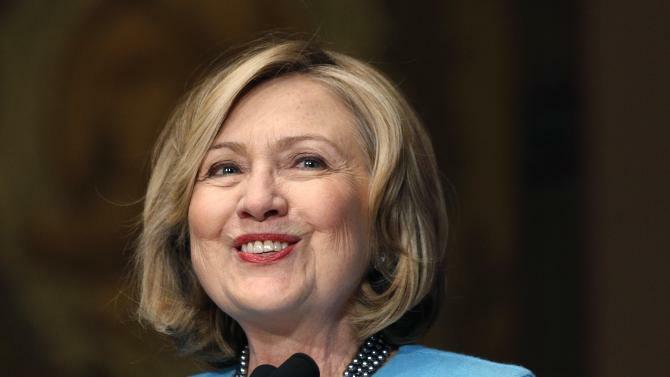 We know that copies Lisa Rogak’s fine collection of Hillary quotes was being raffled off and hope the lucky winners are pleased with their prizes. 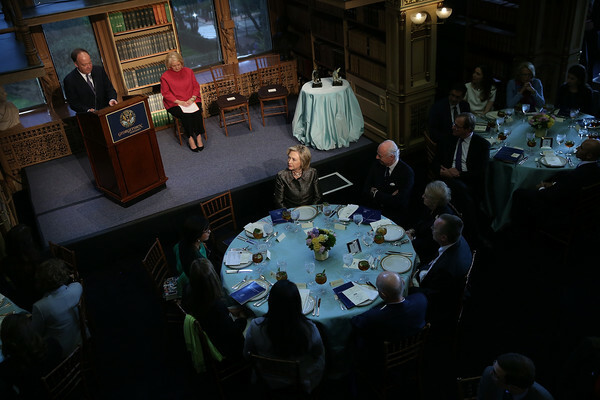 Meanwhile, in D.C. NATO Secretary General Anders Fogh Rasmussen was receiving the Hillary Rodham Clinton Award for Advancing Women in Peace and Security at Georgetown University. 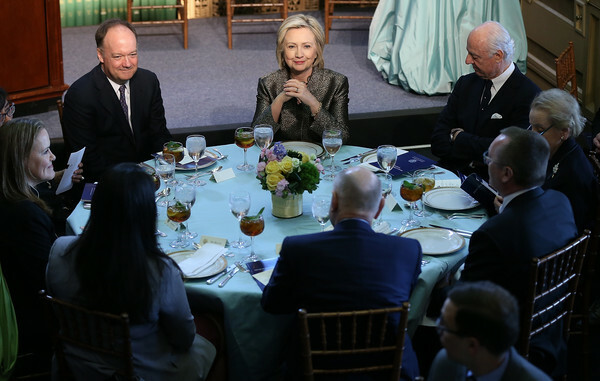 The buzz around Cipriani in New York is that political heavy hitters will attend an AJC dinner this evening in Hillary’s honor but that one big name will be missing. 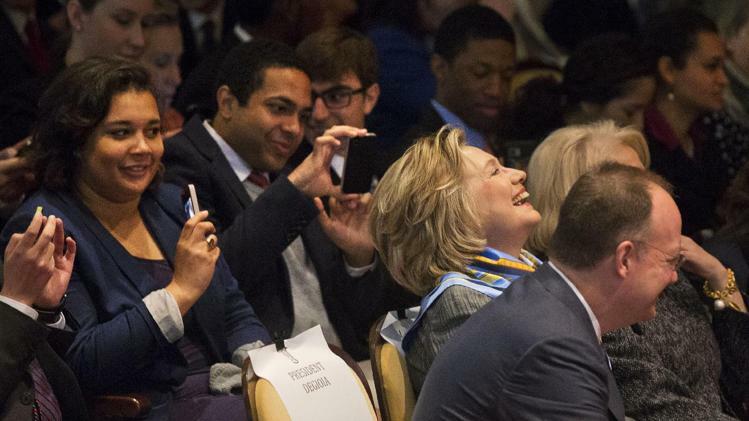 Pols planning to attend AJC dinner for @hillaryclinton tonight at Cipriani: Schumer, Schneiderman, Rangel, Maloney + more. No @deBlasioNYC. Best compliments, Mme. Secretary, for yet another well-earned honor!